Each hair begin to from invisible part of the hair buried 4 mm under the scalp inside a small tube which is called a follicle. As the hair begins to grow, it pushes up from the root and out of the follicle, through the skin where it can be seen. The part we see which goes to make up the hair fibre (shaft), is in fact biologically dead. 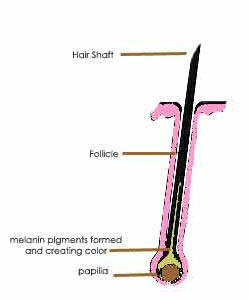 Hair shaft is a complex structure consisting of an inner core structure (called cortex) and a series of protective outer layers (cuticle). Cuticle is the external part of the hair fibre. It is the cuticle which need basic hair care and subjected to attacks which the hair suffers and your hair conditions depending on it. Wind, rain, sunlight, pool and saltwater, harsh chemicals, excessive perms, bleaching or coloring your hair, and mechanical injury caused by harsh brushing can result in damaged hair. 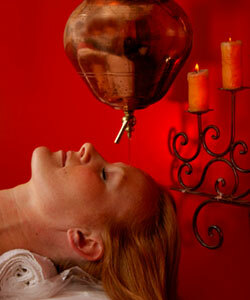 Depending on type of damage, there are special tretments that can help prevent and even repair damaged hair. A short video to show few basics about hair. Blood vessels at the base of each follicle which is called papilla will feed your hair root with nutrition and amino acids and are responsible for your hair growth. This part of your hair also requires hair care that comes from within - a good diet with essential vitamins and minerals. The structure of your hair follicle will determine the type of your hair. If that tube is small, then you will have a fine hair and if its large then you will have thick hair. A person's hair will be straight if this tube is round and will be curly if the tube is flattened. Hair color comes from melanin, the substance that gives hair and skin its pigment. There are two types of melanin one type is responsible for darke shades (eumelanin) and the other is responsible for light shades like blonde and red (phaeomelanin). The mixture and amount of these pigments determine the natural color of hair. So in a way its also true to say that the lighter someone's hair, the less melanin there is. A person with black hair has much more melanin than someone with blond or red hair.